Nestled at the foot of Big Powderhorn Mountain in the heart of Big Snow Country, Base Camp provides ski in/ski out access to Big Powderhorn Mountain on Lift 3 and Wolverine Cross Country Trail. High speed internet provided. We had a great time and everyone was pleased with the accommodations. We had 2 families in this condo. It was roomy and clean. It was a beautiful weekend when we were there so we got to enjoy the hot tub, deck and the fire pit that was a nice surprise. The location was really great on the hill easy access to drive to as well as on the slope. 2 thumbs up!! perfect! this truly was a home away from home! We can only imagine how magical it must be in the winter when the lifts are running and the skiers are skiing! We loved staying here and would definitely recommend this to anyone staying in the area. Forget the mom and pop motels or the chain hotels. Stay here. Location on hill is great. Very easy to access the chair lifts and the cabin itself. Cabin interior is rather outdated but overall still nice. Awesome location, great set up. We will definitely rent this again! Had a blast. House was clean and warm. A little cool but nice! Are skiing was chilly but the stay was very nice. The property had a nice layout with adequate heat. The fire place was awesome. This Cabin had a great view with big windows opening up the whole place to the ski hill. It also has great access to the lifts. The place was a little dated but very clean and comfortable. The new flat screen TV is a nice addition. Great place...great location. Very nice location to watch the action on 3 different runs from the window. Will rent this place again. It was a beautiful area...snow everywhere...loved looking out ALL the windows that faced the ski slope and chair lift #3. Amazing view. Bathroom needed major up dating and better lighting. Old, old couch, sways in the middle, very much in need of new couch. Two refrigerators!!! Nice!...Hard bed in main floor bedroom. Needs better lighting throughout. Overall it is a wonderful, peaceful, retreat from our everyday lives! Although the place is a bit older it has great charm. 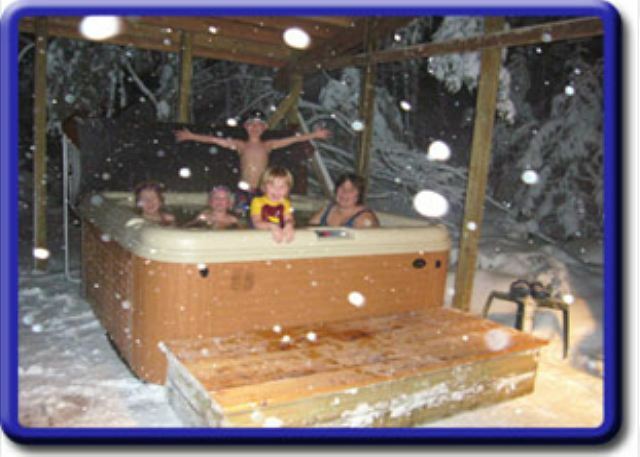 Perfect family ski get-a-way location especially for a couple of families getting together. Everything is there - bring food, drink, skis, swimsuit and relax. Great place an highly recommended. Wonderful as always! The pictures for the site are a little dated. Base Camp 2 now has flat screen tv's and a DVD player as well as fast WIFI access. Two fridges, pull out couch and nice fireplace. Also the hot tub must be shared but we came on a weekend where base camp 1 was empty so we had it all to ourselves. I would definitely visit this chalet again and we will see you next year!!! I loved the property, one of the best we've stayed in at Powderhorn. Due to low snow amounts the hills and lifts that make this a ski in/ski out unit were not open. So, paid for a ski in/ski out unit, but had to shuttle or drive to get to open hills and lifts, which was a bummer. Otherwise would give 5 stars all around. We'll certainly be back and hopefully Mother Nature will be better behaved. Base Camp 2 has a very convienent location. It was a bit hard to locate since we arrived after dark as the directions were vague and road markings were hard to find. The unit was well furnished altho a bit dated. We also thought it was a bit pricey. Love BaseCamp 2! Wonderful location and amenities. Staff were very helpful with check in and even allowing a late checkout. We always have a great time at Powderhorn.